The unsolved homicide of Russell Bean. 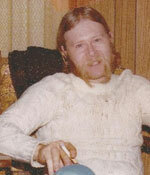 Russell Bean, age 26, was last seen alive on September 15, 1978. His whereabouts were undetermined until a deathbed statement by Clifton Chambers in 1988, in which he implicated his son, Robert Chambers, for killing Russell, and identified the location of Russell's body. In March 1988, the police obtained a search warrant and located the remains of Russell Bean on the property of Robert Chambers, Clifton's son, on Newell Pond Road in Marlow, NH. Robert Chambers was the part-time police chief in Marlow and Gilsum when Russell's body was found. An autopsy revealed that Russell died as a result of blunt force trauma to the head. Robert Chambers was arrested for the murder of Russell Bean, but he was never indicted or tried on the charge and the homicide remains open. Help us solve this case and bring closure to the family of this victim. Use our Tip Form.